The eagerly awaited new album by the Junko Moriya Orchestra--the first in three years--exceeds expectations. This special band of top Japanese musicians has been together for more than 10 years, and the caliber of the musicians is reflected in their high-quality ensemble work as well as stellar solo performances. All ten selections are composed or arranged by Junko Moriya, of course, and her arranging skills are as sharp as ever, not to mention her excellent piano playing. 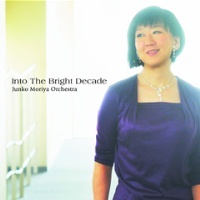 The title track, first performed at the Orchestra's 10th anniversary concert, reflects Moriya's bright outlook and optimism for the next decade of musical adventure. Other highlights include the boppish "Walking Down The Nakamise Street", inspired by one of the oldest shopping street in Asakusa, Tokyo, and the funky and Latin-tinged "The Sidewinder". Pensive and gentle originals such as "Dance A Dance" and "Sing Your Song" serve as nice interludes. Recommended! Recorded September 28 and 29, 2011. 5.6MHz DSD mastering.